The AKB48 election is almost here, and with the recent preliminary vote counts, some are already speculating. 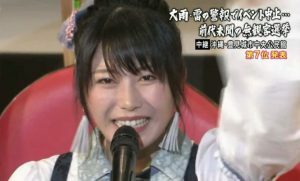 Yokoyama Yui ranked 20th, and talks about what she did after she heard the initial results. At at event to promote the DVD release of Yokoyama’s TV show, “Kyoto Irodori Diary” (横山由依がはんなり巡る京都いろどり日記), Yui-han talks a little bit about the upcoming AKB48 Group Election, and with regards to her placement at 20th. The number seems to change, as some places have reported she voted for herself 1 time, or 5 times. Regardless of her rank, I hope she is up to the challenge of filling Takahashi Minami’s shoes as Soukantoku (General Manager). hey I know how you feel. But its your support that matters to most!